It seems that Telus TV has launched its own Android TV box. The new Telus PVR is Telus Pik TV media box and was announced last week along with the presentation of the company's new pay-TV service. As it seems, Telus will only allow you to buy the box if you are signing to your Pik TV service. So unless you are a Telus customer (or plan to be) then it does not look like you will be able to get this anytime soon. Although, even if you are a Telus customer, you could still find it a bit difficult, as it seems that the Pik TV service is only available in "select cities of Alberta and British Columbia". And, of course, as Telus will only sell you The box if you sign up to your pay TV service of Telus TV packages, you will need to be in either of these two locations in order to be able to purchase the box with Telus pick and pay service. Apart from availability, the box costs $100 above what you are paying for the Telus basic tv package orTeluss sports channels and for that money, there is not much to offer here. For example, the storage on offer comes in at 8 GB and considering, this is general storage. Like Telus notes "the actual formatting capacity will be less." Also, there is no microSD slot on offer - although there is a USB 2.0 port (it is unclear if adoptable storage will work). In any case, the storage is not very good with this box and will be very limited in the amount of content you can store locally. 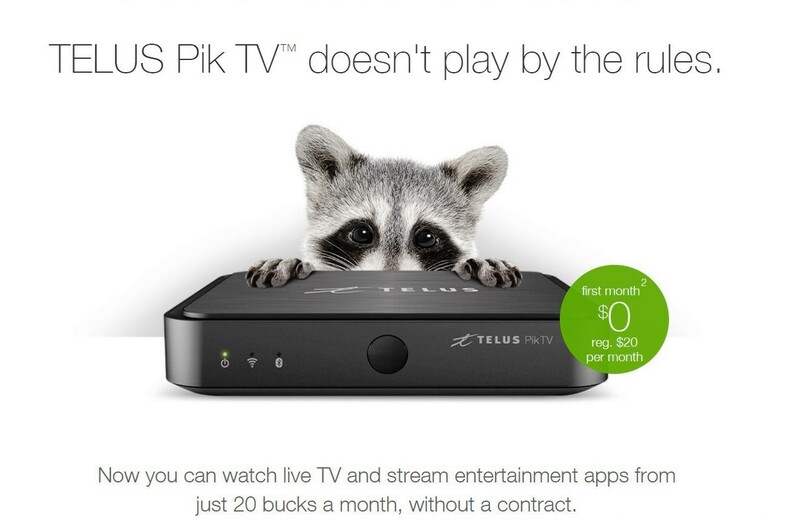 Which suggests that Telus just wants you to use it to watch your Pik TV service. In terms of the rest of the specs, you're looking at 2 GB of RAM, a dual-core Broadcom BCM7252S (1.5 GHz clock) processor, Wi-Fi, Bluetooth, Dolby Audio, an HDMI port, an S / PDIF port , One Ethernet and, surprisingly, select 4K compatibility. Interestingly, the included remote control (connects via Bluetooth) seems pretty detailed and certainly more of a remote control than is available through the usual Android TV boxes. As for the Android TV interface, not much seems to be known about this. Telus clearly states that it is "Powered by Android TV", although Telus has not detailed whether this is based on Android Marshmallow or Nougat and conveniently, there are no real screenshots of the interface on offer. Just some of the top Android TV box apps you can expect to use like, Netflix and YouTube. In reality, although not confirmed, it is very likely to be an example of the integration of MediaFirst that is now available to pay-TV operators. For those who plan to give it a try, as long as they meet the requirements (a Telus Internet client and live in AB or BC), then the actual Pik TV service starts at $20 CAD per month for the Telus basic TV package - which Includes "your choice of 5 specialized channels", plus 23 local and regional channels. While additional channels like Telus sports channels start at $4 CAD per month, per channel. This is a type of service without a contract and by the time Telus is offering the first month free (a savings of $20 CAD), as well as a 30 day satisfaction guarantee for the cost of the box - to be paid through a $100 CAD credit that will be applied to the account holder by providing "Pik TV media box returned, in good condition and with the original packaging, within two weeks after submitting the cancellation." The good news is that this is also a service that once subscribed, will allow you to view content on any Android device, as there is a corresponding Android app available in the Google Play Store.